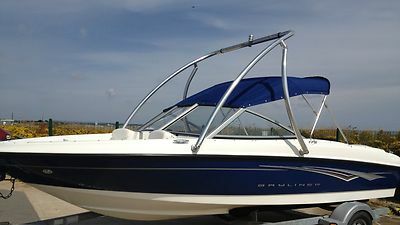 Bayliner 175 Bowrider 2008 Boat in Good Condition comes with wake tower and has a high 5 stainless steel prop ideal for wake boarding, ski-ing and towing.Ski locker, power trim/tilt, navigation lights. The 2 main seats fold down to make sun loungers, includes bikini sun canopy.Has 3.0 litre Mercruiser 135hp petrol engine in excellent condition. All seats in excellent condition with no rips etc.The dials are all in working order, comes with factory fitted radio with MP3 adaptor and 2 speakersIncludes anchor and chain, 2 paddles and trailer plus full water proof cover.On the one side of the boat there are some marks on the gel coat which are from where fendors were used by the previous owner, as you can see in one of the photos.I have owned the boat for 3 years and have had plenty of fun with the family on the sea. The boat is flushed out every time after use and washed inside and out with hot soapy water. I have taken out the carpet and fibre glassed the floor as this prevents condensation and keeps the boat nice and dry and easier to maintain, as carpet takes ages to dry out.Reason for sale, I am buying a newer model of this boat.Any questions please email me or phone me on 07956 856631. If you want to test drive the boat this can be arranged at the cost of the launch fee. I will only accept cash on collection and a receipt will be given thankyou. The boat is currently stored at a local boat compound in Bridlington, East Yorkshire where I would ask you to collect the boat from.